I had been drawn to railroads almost since birth, but at age 14, in November of 1966, experienced my first really worthwhile railroad adventure. 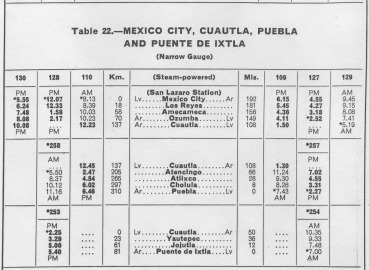 This was a three day trip I made to Mexico City with family friend Joe Thompson, expressly to see the last steam locomotives operating in regular mainline revenue service in North America. At that time the National Railways of Mexico had a fleet of awesome standard gauge 4-8-4s in helper and extra pool service on the lines running north out of the capital, and I was truly fortunate to see them just before their retirement. Just as special, in a totally different way, were the last narrow gauge lines running to the south and east toward Puebla and Cuautla (pronounced like "clout" with a W instead of the L and a LA stuck on the end: KWOWT-la), which had been built and operated before nationalization by an English company, the Interoceanic Railroad, or FCI. 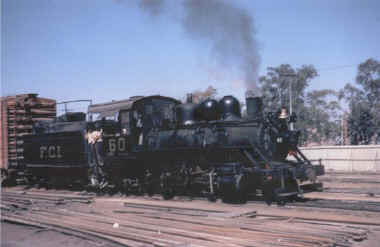 2-8-0 #60 was the first of the outside frame locomotives which ruled the Mexican narrow gauge during it's heyday. Her fireman catches up while one of the field men ties handbrakes on a cut of standard gauge boxcars spotted for loading at the warehouse in the background. One track over, stevedores load another standard gauge car at the public team tracks. NdeM #254 must be low on water, since her hatch has been left open as a reminder to the crew. 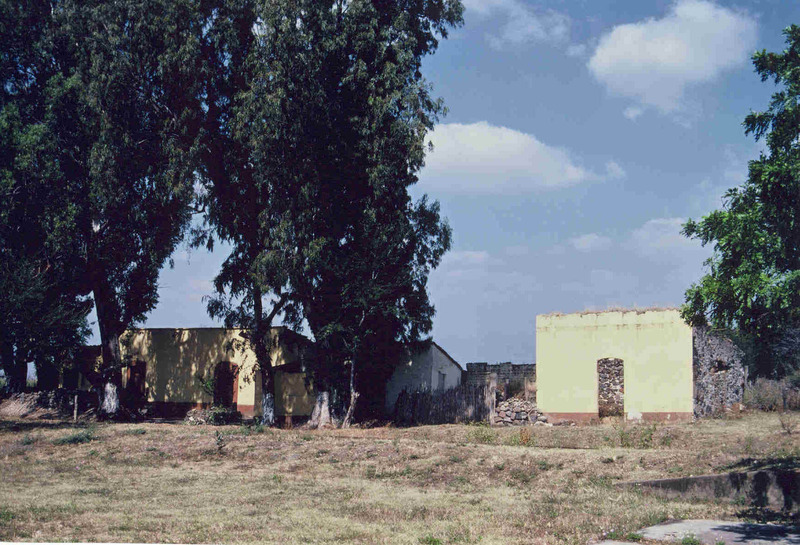 Early on our second day, we caught a cab for San L�zaro terminal, a run down looking collection of dual gauge tracks and falling down buildings on the east side of town near the Puebla highway. The day before we had gotten permission to enter the complex from a helpful official in the NdeM headquarters located across the street from Buenavista Station. As we got close, the air became smoggy and smoky, and a steam whistle called the crucero (crossing guard) out of his shack to flag us to a stop. An ancient narrow gauge 2-8-0, #254, took possession of the crossing, then made a reverse movement before allowing us to pass. She was switching standard gauge cars without any kind of idler car on the three rail track. 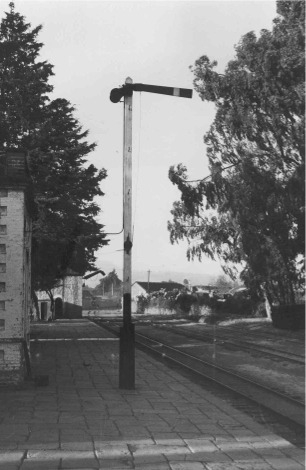 This was possible because NdeM used the same coupler height and size on both narrow gauge and standard gauge rolling stock, and the narrow gauge power assigned to these jobs had been fitted with coupler pockets having a wide swing. 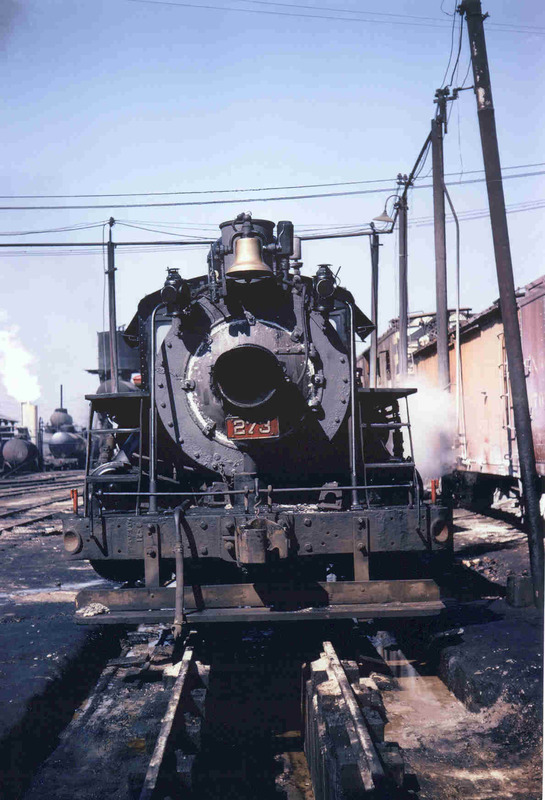 By November 1966, the ready tracks next to the San L�zaro roundhouse held only this one yard engine, #273. The mud on her footboards and the grease and sand slopped all over everything disguise her fresh paint and shiny brass. It had only been a little while since these tracks were jammed with outbound steam power, and the #273 wore a boiler tube pilot, and there were no diesels on the NdeM narrow gauge. Next in line were three workmen rolling some narrow gauge wheelsets toward the shop. We got out of the taxi and followed them past the guard shack, inside the corrugated iron fence, passing along the way some very informal residences, trackside food vendors, and a sort of red light establishment. 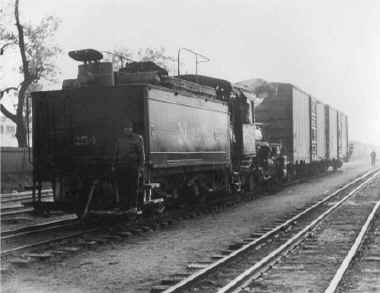 The tracks, perimeter fence, and a cut of standard gauge boxcars formed a dark canyon shaded by a thick, black cloud coming from an outbound narrow gauge freight. An olive green, wooden, truss rod caboose proudly displayed the name INTEROCEANICO in gold on it's fascia boards. Twenty cars ahead, a standard NdeM Baldwin G-030 class 2-8-0, #262, pumped up the air brakes and smoked like the burning of Rome. I'm guessing she was due a new set of flues or else had a very green fireman, because her stack never cleared, ever. When we reached the head end, we took a few pictures, then moved down to the wye and set up for another shot of the train leaving. 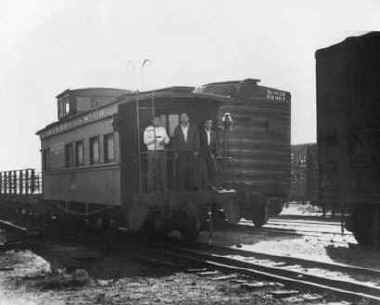 At the time I never dreamed that many years later, my going away view of this FCI caboose would be included in Volume II of Francisco Garma Franco's history of Mexican railroads. Engine #262's smoke smothers the yards in gloom, while the crew of this departing eastbound freight enjoys a different kind of smoke. The roundhouse was red sandstone brick with graceful arches over most of the ten stalls and a corrugated metal roof adorned with a ventilated clerestory. 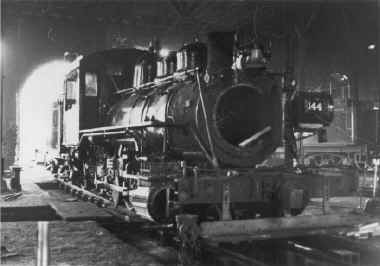 Another road engine downgraded to yard service (as evidenced by the footboards), Oriental Mexicano #144, sits in stall #9. Stall #8 originally was a run through track, but by 1966, I couldn't tell where it had led. Steam obviously was not quite done when this picture was taken in November of 1966, as ongoing repairs to OM #144 would indicate. Twenty years before I rode in her cab, #279 looks to be in fine shape. The roundhouse was red sandstone brick with graceful arches over most of the ten stalls and a corrugated metal roof adorned with a ventilated clerestory. 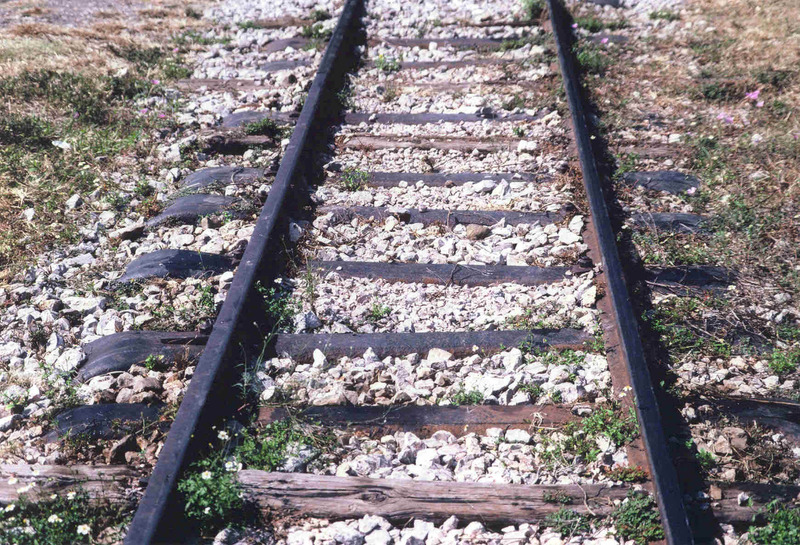 In typical Mexican fashion, old rails were incorporated into it's construction. Two G-030 engines, #270 and #279, occupied stalls inside, and appeared to be in good order. 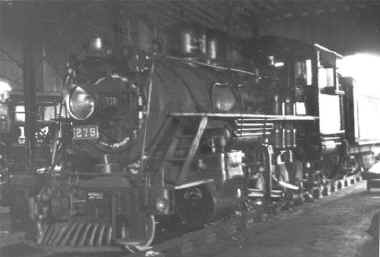 A G-024 class, OM #144, sat in stall #9 with air hoses and trouble lights strung into her open smokebox. There was new wooden lagging on her right hand cylinder, but no jacketing, and the front head and piston had been removed. Her main rods sat on two horses next to #8 stall, and their wrist pin bushings and main bushings had been renewed. Next to the turntable, the carshop had lost much of it's walls to earthquake damage over the years. Nobody seemed very concerned by this. In front of it was freshly painted G-030 #273, slightly different from others of her class because she had piston valves and footboards. Her tender was topped off, and she was hot, greased and wiped down, obviously waiting for a call. Freshly painted #273's tender was topped off, and she was hot, greased and wiped down, obviously waiting for a call. A couple of tracks over from the simmering #273, #60 lays into a string of loads. Most of the action seemed to consist of switching standard gauge box cars to and from the industrial sidings served by the narrow gauge. 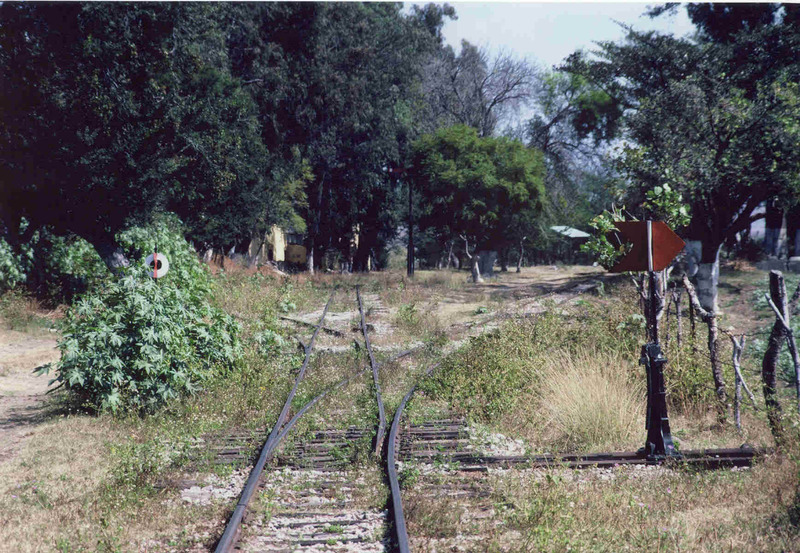 Many of the tracks in the San L�zaro terminal had been three railed for this reason, with the intention being to someday remove the narrow gauge rail. Fortunately the NdeM didn't yet have quite enough diesels to go around, so FCI #60 was taking care of business in the freight yard. She had been the very first of the new generation of outside frame 2-8-0s that had dominated the FCI and NdeM narrow gauge main lines since the early part of the century. Much modified and modernized over the years, she appeared capable, agile, and clean in her old age. #60 seemed to know her way through the maze of dual gauge puzzle switches without any guidance from her crew, who looked as if they were just along for the ride. #60 seemed to know her way through the maze of dual gauge puzzle switches without any guidance from her crew, who looked as if they were just along for the ride. Everything got very still and quiet around lunch time. The little bit of narrow gauge switching was being done by one of the 10 brand new EMD GA8 diesels, NdeM #5406. Compared to all those cute little steam engines, the new EMD GA8 diesels just weren't too interesting. As lunch hour arrived, the yards became very quiet and still. 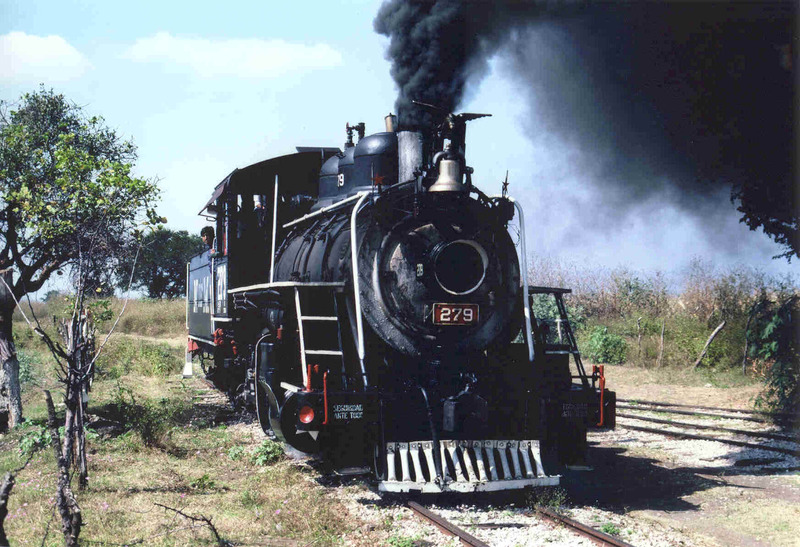 We decided to spend that afternoon at Valle de M�xico, but to devote all of our next day to the narrow gauge. Hiking back the way we had come, past the guard shack, and out the gate, took us over a street crossing and up to the gate in the wall surrounding the platforms, tracks, and central building of Estaci�n San L�zaro, where we caught a taxi. The style of architecture matched the roundhouse, and the whole complex was definitely impressive, but not on quite such a grand scale as the IRCA headquarters in Guatemala City. 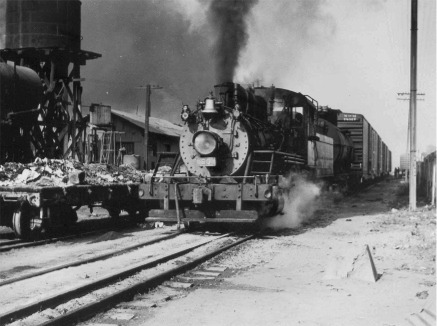 The "romance of the rails" means loose women living in some of the tin shacks along the San L�zaro yard lead. Unfortunately, this area was cleaned up long ago. The next day at San L�zaro was pretty much like my first day, but without the departure of #262 on a freight. I didn't mind seeing everything for a second time around. The last outbound train of the day was the Ozumba local, which went about half way to Cuautla, turned around and came back. We stood in line with the campesinos, machateros, trabajadores, and their chickens and dogs, bought our tickets, then took our seats in the nearly empty first class coach. Leaving Mexico City the tracks ran for some distance in the median of the highway to Puebla, reaching the settlement of Los Reyes just outside of the city. The country here was once under the waters of Lake Texcoco, and resembles a dried up lake bed to this day. 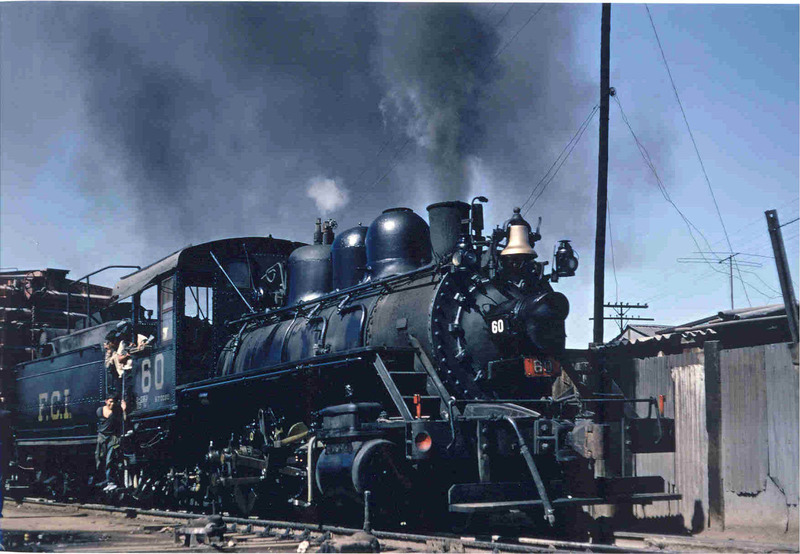 We made a station stop, and #262 was waiting in the pass for us with a train of mixed freight, and a clean fire. That didn't last long. As soon as we cleared the west switch, she whistled off and entered the main line, rolling her 20 or so cars back to San L�zaro in a chokingly thick cloud of greasy black smoke. I'm guessing that the engineer cleaned up 262's fire while they waited in the pass for us to arrive on the outbound Ozumba local at Los Reyes, November 11, 1966. 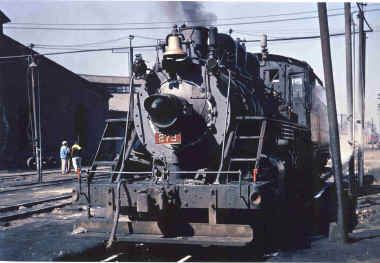 #262 was the first of the G-030 class built by Baldwin for the NdeM to use on the FCI. The smoke became chokingly thick again as soon as the throttle was opened. Chalco was the next station stop, another Mexican village like none other, yet sharing the same folkloric conventions as all of them. All I can say is that the NdeM narrow gauge was like one of ours, but that they had their own style, and their own versions of almost everything. Their water tanks were usually steel on stone bases, or sometimes supported on a trestle base made of rail. Those built by the FCI were square, made up of ribbed cast iron sections, placed atop a square stone base. Cattle pens, telegraph poles, and sign bases are all made from old rails. 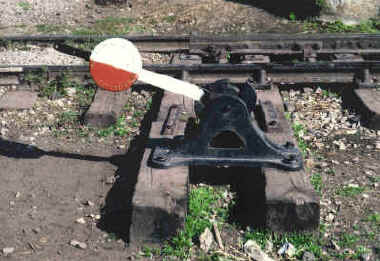 The roads are guarded with crossbucks, just as in the states, but Mexican ones are cast in one piece and mounted on an upright made from old rail. At least 99% of them say "CUIDADO CON EL TREN" (careful with the train). 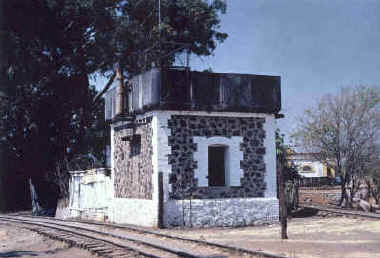 Depot buildings were often stone, and could show either Spanish, Native Indian, American, or European influences. The landscape of this region is dominated by the world famous volcanoes, Popocatapetl and Ixtaccihuatl, visible from many locations along this section of railroad. 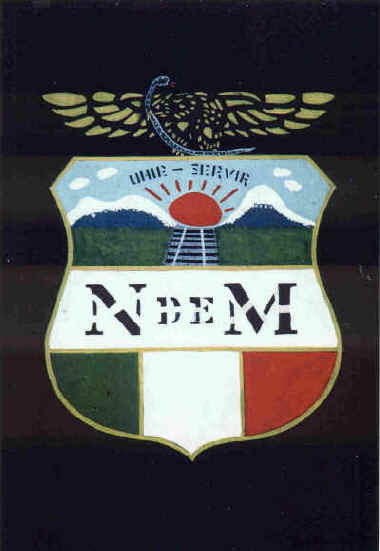 These are the same two mountains depicted on the fancy old style NdeM herald, shown here hand painted on #279's tender. By the time we reached the summit at Amecameca, the Nopales and Agaves (Prickly Pear and Century Plants) had given way to pine forest resembling Colorado. Instead of the Rocky Mountains, the landscape of this region is dominated by the world famous volcanoes, Popocatapetl and Ixtaccihuatl, visible from many locations along this section of railroad. These are the same two mountains depicted on the fancy old style NdeM herald. We stopped again, and then left town running for at least a mile through an alleyway between two rows of adobe block houses. In 1965, the notations "narrow gauge" and "steam powered" in the NdeM English language public timetable were very interesting to me. At Ozumba we got off, rather than return right away to Mexico City. 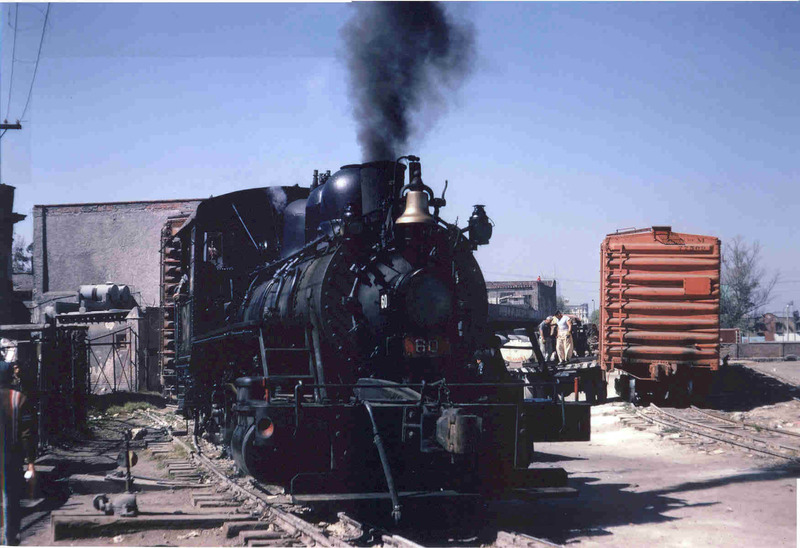 Our plan was to wait there for the train returning from Cuautla, hoping that maybe we would see another freight or two pulled by steam power. After the local turned around on the wye and left town, we had a long, dull wait. No trains came through, so we passed the time by exploring the yard, eating Mexican junk food, and walking along the track for a little ways in both directions from the station. Ozumba had a typical FCI style water tank and a standard order board mounted on a mast set into the cobblestone platform. 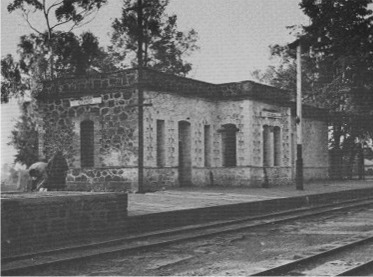 The depot building is considered a classic, and it was copied for the design of the restaurant building on the grounds of the Museum of Science and Technology in Mexico City. I was told by Arquitecto Esteban Walker that it features a style of nearly flat roof from Spain called Boveda Catalana which is covered over by a layer of naturally occurring asphalt. The natives call this material chapapote because of the bubbling sounds it makes coming out of the ground. I only took a few pictures, but somehow three of them also made it into Sr. Garma's book. No doubt that will forever be the peak of my publishing career. Above 3 photos, top to bottom, Ozumba station, water tank, and FCI order board mounted on a mast set into the cobblestone platform. All views looking towards Mexico City. 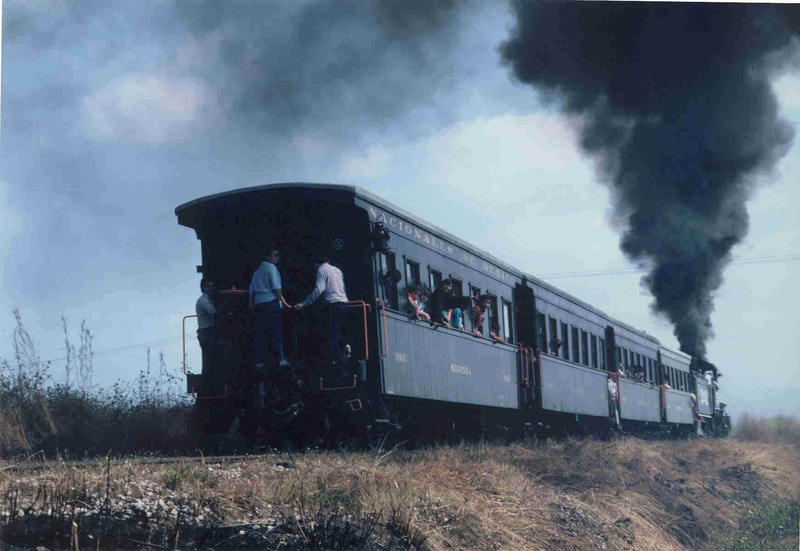 It was almost dark when the Cuautla train arrived, and we saw very little on our return trip other than the fancy old time appointments inside the first class coach. The Conductor and a soldier were the only other occupants of this car. 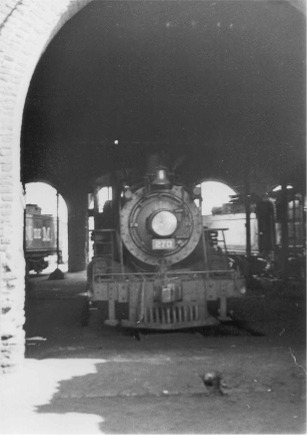 The train had to be wyed before backing into the stub ended tracks in Estaci�n San L�zaro, and we looked over at the smoke and steam rising from the nearby roundhouse. Taking our lives in our hands, we walked back through the yards so we could spend a last few minutes there watching the fireboxes flash and glow in the night. The glare of the floodlights cast spooky gothic shadows, and the place looked like a graveyard sheltering the simmering ghosts of baby Mexican steam engines. It came time for us to leave, and I thought that I would never see any of these wonders ever again. I knew I would never forget them. 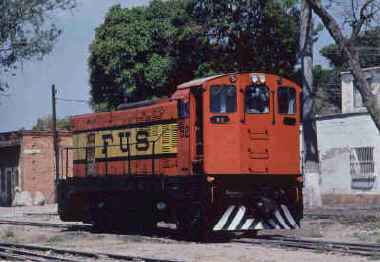 FCI #67, now displayed at the Monument to the Revolution in Mexico City. Our family stopped briefly at San L�zaro during a vacation to Mexico City in June, 1970. All was quiet, but we dropped in around lunch time. We also had no permission to be on the premises. 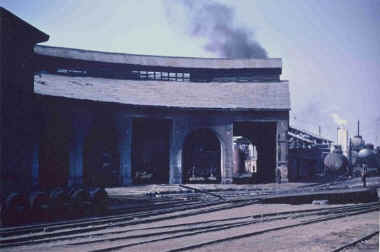 Everything was still the same as it had been in 1966, with a couple of hot engines in the roundhouse. 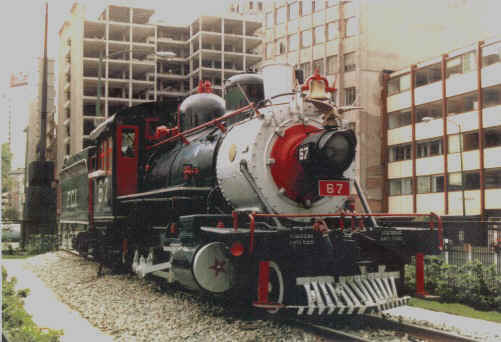 Notable among them was FCI #67, now displayed at the Monument to the Revolution in Mexico City. We were able to find somebody who spoke English, but he said he couldn't move a locomotive without an order to do so. Too bad I wasn't smart enough to offer a small consideration in lieu of such an order. If we had stayed around, I'm sure an engine would have moved in due time, anyway. They don't bother firing them up for no reason. In 1973 the narrow gauge from Mexico City to Cuautla was finally replaced with a standard gauge line, and these last steam engines on the NdeM ended their service lives. The roundhouse at San L�zaro was vacated, and afterwards used for bulk grain storage. Soon, lightning struck, and the building was destroyed by fire. Another fire gutted the old station and office building, which had been set aside for preservation, and it's remains were shaken down by an earthquake a little while later. Today, nothing survives but the entranceway, which has been incorporated into the foyer of an apartment house built on the site. The restored Mexican narrow gauge train makes a beautiful sight storming across thefree highway crossing at Lienza los Escalona in November of 1986. Although I tried for years to get pictures of this operation published, nobody in the states was interested!!! After the end of service, the tracks were left in place from Amecameca to Cuautla. This was the oldest section of narrow gauge in Mexico, having been completed from Mexico City in 1881 under the name of Ferrocarril Morelos. 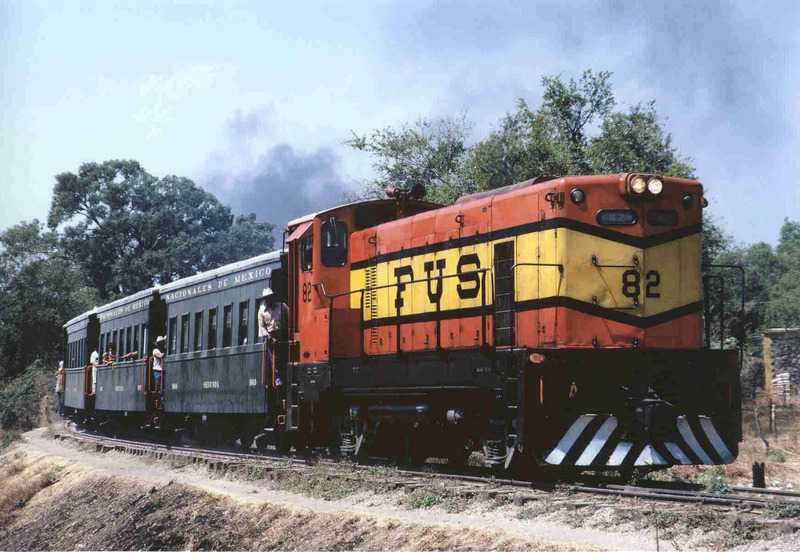 Service as a tourist attraction was reinstated in July of 1986 from Cuautla to Yecapixtla using my old friend, NdeM #279, and four little second class coaches. I was able to ride the NdeM narrow gauge again on November 11, 1986, twenty years to the day after I rode the Ozumba local, and I still have both tickets. Twenty years to the day after I rode the Ozumba local, and I still have both tickets. Compared to all those cute little steam engines, the new EMD GA8 diesels just weren't too interesting. This example wears the paint of the railroads in the Yucatan, where she worked before being brought to Cuautla. Ugly, but versatile, this design can be changed from standard to narrow gauge easily because the traction motors are mounted in the carbody. The trucks have crown and bevel gear sets which are connected to the motors by automotive style driveshafts. A taxi brought me from the capital, and I arrived about the same time as the engine crew. My interest in the yards and equipment was obvious to them, and they soon introduced themselves. I had originally intended to have the taxi pace the train for pictures, but my plans were changed when fireman Pedro C�rdenas took my camera bag and locked it in the toolbox on #279's tender. 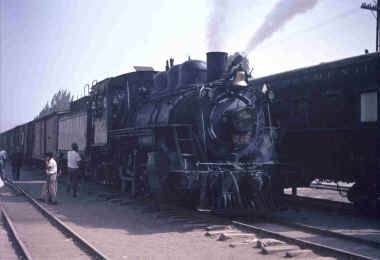 Although the railroad was considerably cut back from the way I remembered it, my ride was going to be in the cab of a Mexican steam engine. I didn't get to do that in 1966, so this was fine compensation for San L�zaro being forever gone. The facilities in Cuautla had changed little from steam days, providing the perfect ambience as #279 built up pressure. British style switch stand installed by the FCI still pops the points over in the Cuautla yards. 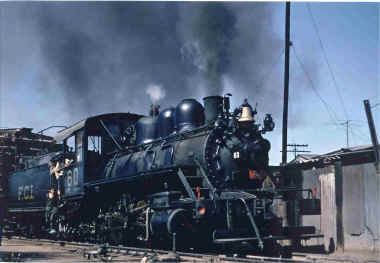 The facilities in Cuautla had changed little from steam days, providing the perfect ambience as #279 built up pressure. 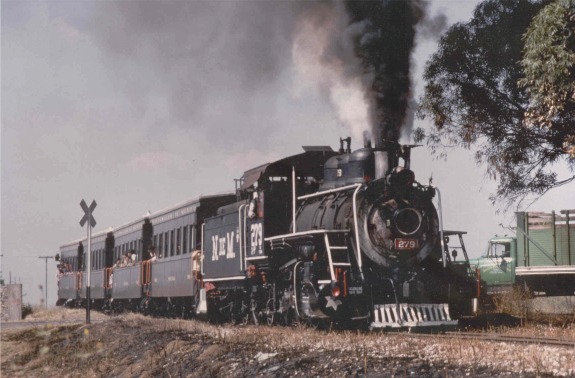 Riding in the cab was all I could have possibly wanted, and I know our classy little train made a fine sight climbing the skinny rails to Yecapixtla that morning. My Spanish was to improve immensely in the next few years, but was only in the most basic stages on this occasion. All day I struggled through translations with a pocket dictionary, and was rewarded by getting to know the trainmen and hearing them talk about their experiences in the narrow gauge past. The operating employees were all from the NdeM, and several of them had been working at San L�zaro when I was there in 1966. At lunch, the abandoned station platform, sidings, water tank, section workers housing, and FCI order board painted a very vivid picture of the old days. Exploring the yards over and over, I noticed in the track a number of pressed steel sleepers imported from England almost a century before by the Interoceanico. Several grazing pack burros and a beautifully preserved, living, narrow gauge passenger train completed the illusion that the NdeM itself still lived. 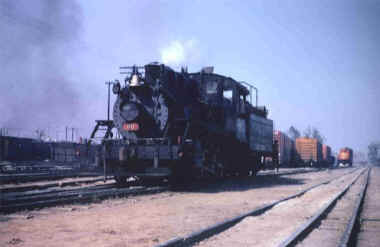 Service as a tourist attraction was reinstated in July of 1986 from Cuautla to Yecapixtla using my old friend, NdeM #279. At lunch, the abandoned station platform, sidings, water tank, section workers housing, and FCI order board painted a very vivid picture of the old days. Yecapixtla yards were built in a Eucalyptus grove because of the availability of groundwater. 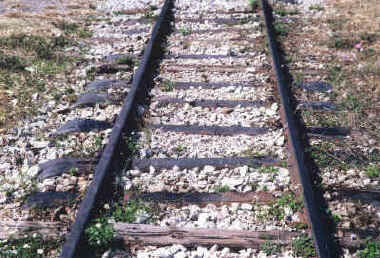 I noticed in the track a number of pressed steel sleepers imported from England almost a century before by the Interoceanico. 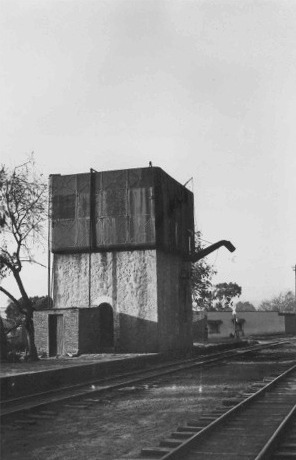 The water tank was of typical FCI British style, but provided with a spout on each yard track. Later that week, I hired the taxi for all day again, and took some pictures of the outbound trip from line side. There was no place to turn the engine at Yecapixtla, so the return trip was always operated tender first. 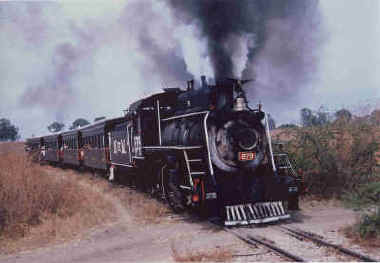 Since this didn't photograph too well, I again rode the engine back to Cuautla with my friends. #279 eventually was taken out of service, and a diesel filled in on the tourist train. I was fortunate enough to visit the Ferrocarril Interoceanico another half dozen or so very happy times in the next few years. On one of my trips by car from Mexico City, I stopped at Ozumba. Everything was still just as I remembered it for the most part, but the station building was locked tight. Scrappers had removed the upper section of the water tank, but not an old FCI tender which had been there twenty years earlier. On a clear day, this shot of the restored Mexican narrow gauge passenger train taken at Puente Vista al Popo, would have included the world famous volcano in the background. That didn't matter to me very much after a couple of swigs of Tequila Tres Generaciones, and these photos always bring back some of my most pleasant narrow gauge memories. Typical FCI water tank still standing at the old helper station at Cuautlixco Junction. The line in the background once went to Puente de Ixtla, while the track in foreground went to Mexico City. 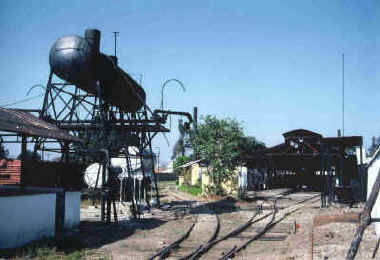 The third rail was added after 1973 so that the sand cleaning facility in the old yard in Cuautla could be used by the standard gauge. Today the goal is to re-lay 4 kilometers of track to reach the wye at this point. Eventually I became involved with the Mexicano del Pacifico on Mexico's west coast, then with the FEGUA down in Guatemala. It has been 12 years since my last visit to Mexico, and only recently have I been able to communicate more or less closely with some of my old friends through the magic of the internet. I know that the FCI in Cuautla has been closed for the last two years, and that the tracks were taken up from Yecapixtla to the wye just outside of the Cuautla depot. In Ozumba most of the tracks have been removed, and the historic stone depot building has been converted into a suburban bus station. Just minutes before this article went out, I received a call from Capitan Angel Zamarripa, who very kindly contacted me on behalf of the museum in Cuautla to bring me up to date. 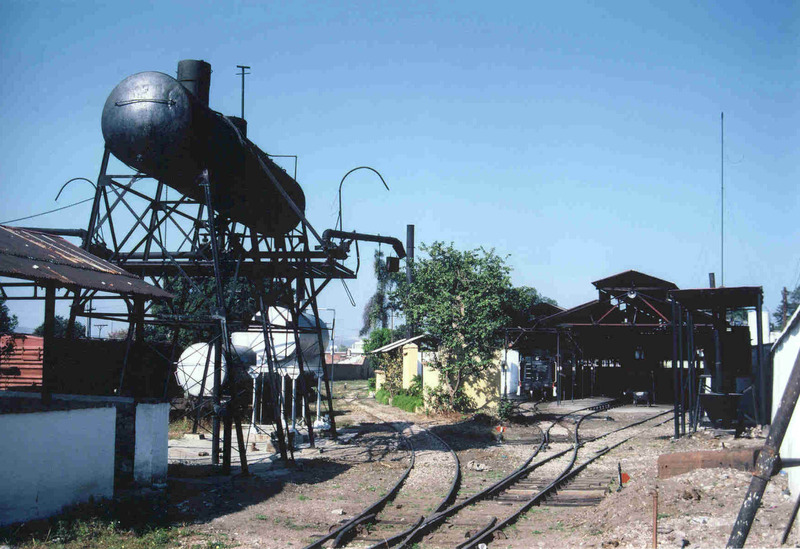 The official name of the project organization is: PATRONATO DEL FERROCARRIL INTEROCEANICO HISTORICO DE CUAUTLA, and there are still dedicated believers and ex NdeM employees working to keep the narrow gauge alive. 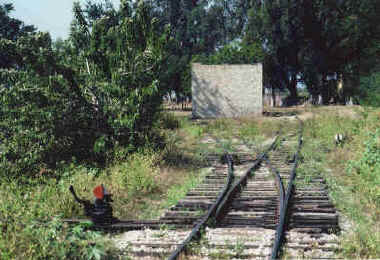 Their first goal is to re-lay the 4 kilometers of track from the Cuautla station to the wye at Cuautlixco junction. The second goal is to restore the four wooden passenger coaches, which have run down terribly. 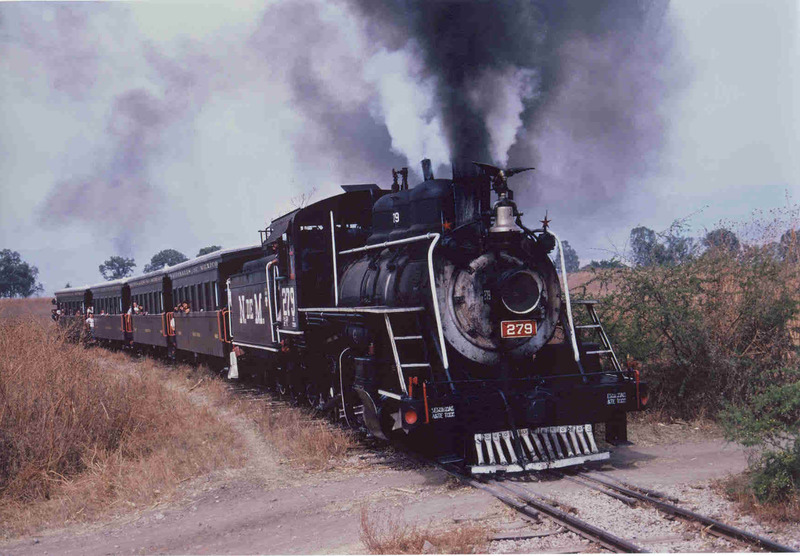 The #279 is in fine condition, and has operated within the Cuautla station grounds several times recently, while there are also talks underway to bring another NdeM steam engine or two to Cuautla in the future. There are still around a dozen of them scattered throughout Mexico. Mexican narrow gauges were like ours, only different. 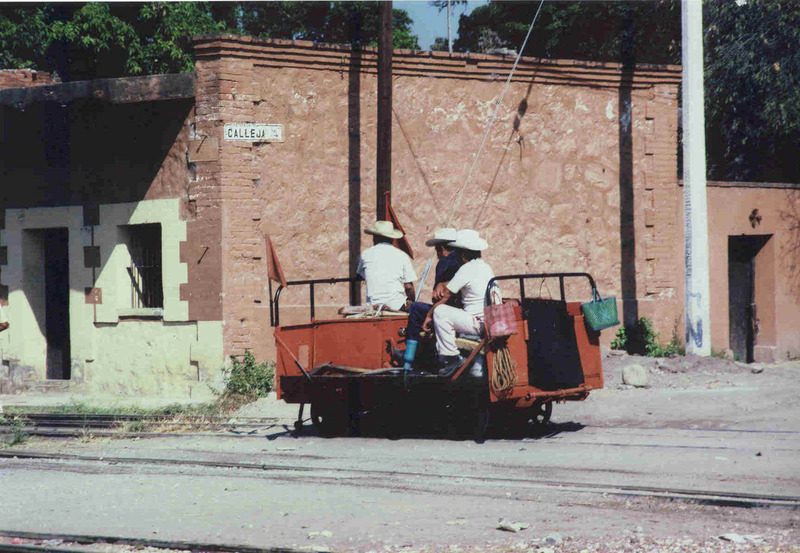 Just as Mexico has it's own art, music, literature, dance, clothing, cuisine, and folklore, it has it's own distinct flavor of narrow gauge. There is still on the premises a serviceable GA8 diesel from the FUS in the Yucatan, shown at Cuautlixco, filling in for #279 on the tourist train. I appreciate this locomotive more than I did back in 1966 because my experience has taught me that a reliable diesel is a handy thing to have in a steam locomotive shop. Not only are they good standbys, but they can pull a dead steam engine quickly out of harm's way in the event of fire, spot it for repairs, and make compressed air for firing up from a cold start. There is no definite schedule for public operations at this time, although any future activities will be announced on the internet. The museum needs money and labor and help of all kinds, but there is no mechanism in place to receive these things. Certainly there have been many changes since my last visit, especially the privatization of the National Railways of Mexico and the increasing popularity of the various stripes of train hobby in Mexico. If you really want to know more, the only thing to do is go see for yourself. I've always been treated very well in Mexico --- I bet that's one thing that hasn't changed. Like so many proud railroaders, Pedro C�rdenas lived a good life working for the NdeM. As I've traveled by train in Mexico, I've met plenty of others who learned railroading in the smoky tangle of three rail tracks called San L�zaro. It is a bond which can't be broken, and a tradition they always wish to share. AMISTAD ANTE TODO. 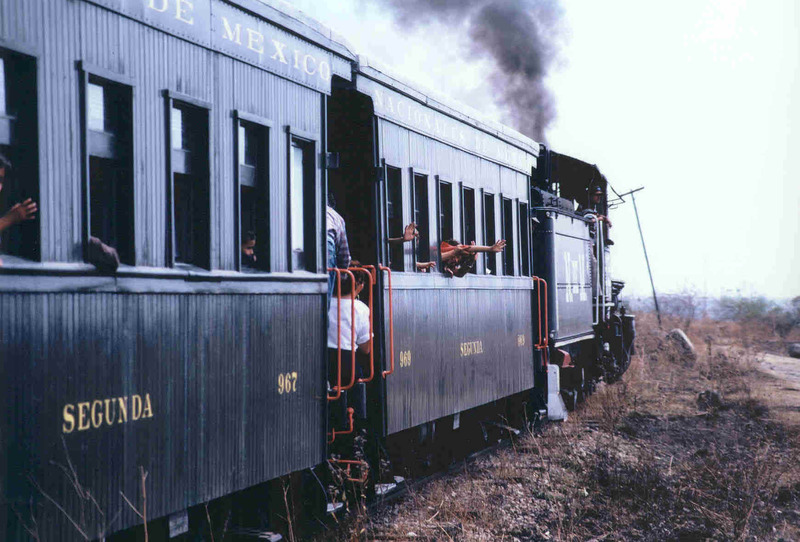 Any number of nice people have helped me in my travels to the Mexican narrow gauge --- Joe Thompson, H�ctor L�ra, Ruben Carvajal, Ing J.E. 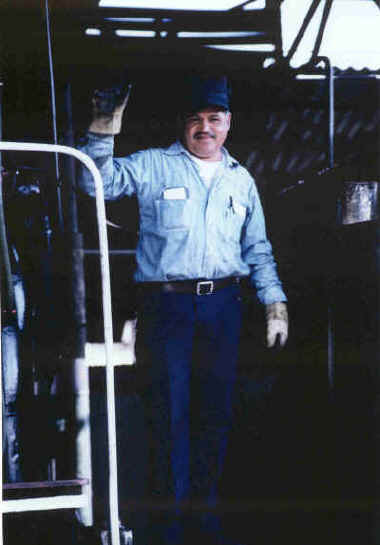 Artigas, the late Sergio Coello, Cliff Prather, Rogelio Bautista, as well as all the operating employees in Cuautla including Pedro C�rdenas, Vincente Gonz�lez, and Octavio Vazquez. Mexlist is pretty much my only present day source of information, and I thank webmaster Lowell McManus as well as recommending it to interested parties. Finally, mention should be made of the "Club Amigos del Ferrocarril", an organization of modelers, historians, retired rail workers, etc. dedicated to Mexico's rail heritage. Not only are they responsible for saving the narrow gauge in Cuautla, but their motto bears repeating: "Amistad Ante Todo". This was taken from the Spanish railroad slogan meaning "Safety First", only their version means "Friendship First".